Cancan's unique magenta red to light pink color is blended with creamy white towards the center and the outside of the petals. The blooms are cuplike in form, semi-double, and medium in size. 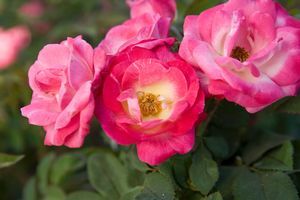 A continuous bloomer, Cancan is a hardy rose with great disease resistance. Bill Radler, breeder of The Knock Out Rose series, has added this climber to his list of great success'.